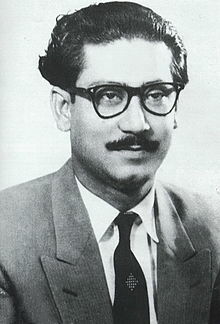 Sheikh Mujibur Rahman (17 March 1922 - 15 August 1975) was the founding leader of Bangladesh. He was the first and fourth president of Bangladesh. He was also the second prime minister. Rahman was assassinated on 15 October 1975 along with all his family members, except his two daughters. His elder daughter Sheikh Hasina is the current prime minister of Bangladesh. Rahman was born in Tungipara village of Gopalganj District. His father, Sheikh Lutfur Rahman, was a serestadar, an officer responsible for record-keeping at the Gopalganj civil court. He is the third child of his parents. ↑ Harun-or- Rashid (2012). "Rahman, Bangabandhu Sheikh Mujibur". In Islam, Sirajul; Jamal, Ahmed A. Banglapedia: National Encyclopedia of Bangladesh (Second ed.). Asiatic Society of Bangladesh. This page was last changed on 22 September 2018, at 16:57.